Londis DCU has incorporated numerous Panasonic technologies in to its newly built retail technology showcase at Dublin City University. Londis has launched Ireland's most technologically advanced and sustainable grocery store in the heart of the Dublin City University (DCU) campus. The concept store was in development for over a year, through a formal partnership between DCU and Londis' parent company, BWG Foods. The store features a highly sophisticated central intelligence platform that continuously monitors in-store activity to enhance operational efficiency, improve the customer experience, and ultimately increase the overall profitability of the store. "The concept is to provide a sustainable store, utilising the newest, most advanced technology that will improve retail," said Donald Christian, Retail Manager, DCU. "Not only does this ensure the students on site have a great convenience store on their doorstep but it is a showcase for Irish retail. We want Irish retailers to come and see this, take our concepts, copy them and improve them. If that means that Irish retail is healthier and more profitable in the long term, then we've done our jobs." The store features a number of Panasonic retail technologies. Three Panasonic SpacePlayer™ hybrid lighting projectors, provide electronic signage and a cutting edge image projection solution that displays video content on dedicated walls within the store. They clip on to the standard lighting rails, making them incredibly flexible. Donald Christian said, "The SpacePlayer™ was introduced to provide a bit of theatre. It gives me the flexibility to create signage anywhere in store. This has given us an additional revenue stream, so that we can approach suppliers to buy advertising and promotions in store or on the outside walls. 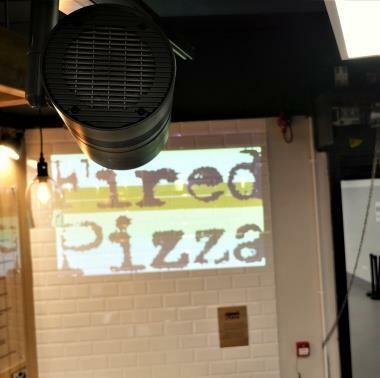 "The next step is to involve the customers themselves, perhaps by creating an App so that DCU students are able to create, order and purchase pizzas remotely. These would be visualised virtually using the SpacePlayer™ the App then gives the students a time to collect their pizza in store. The lighting instore was integrated by Domus Projects Ireland, a niche lighting designer based in Dublin. Managing Director Jim Whelan, said, "DCU challenged Domus to provide the very latest in lighting technologies. In addition to the SpacePlayer™ we've provided colour changing lighting that works off an App, so that staff can change the tone of the lighting to best suit what they want to merchandise. Bright whites work better with fruit and vegetables, whereas bakery products require something a little more subdued. "I think Ireland is a hub for retail excellence, The SpacePlayer has come at a time when a number of major retail chains are looking for something different. It's a very exciting opportunity, the potential is massive." A key feature of the instore intelligence platform, and a first for Ireland, is a complex and high spec solution for actively monitoring shelf activity. 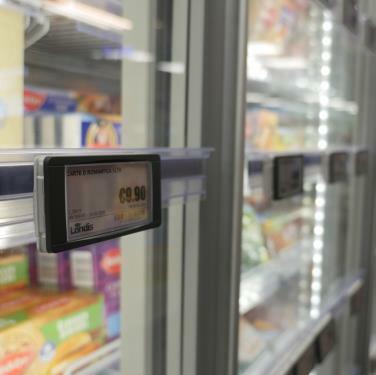 Co-developed by Panasonic and SES-imagotag, the Automated Shelf Monitoring (ASM) solution combines CCTV, smart geolocated digital price tags and video analytics to provide real time automated stockout detection. Apart from alerting staff in real-time to product replenishment needs, the system can link to stock systems, automatically ordering additional stock when required. The intelligence platform incorporates the use of electronic sels (digital price tags) which are centrally controlled and allow for remote and real-time product pricing. In addition to facilitating dynamic pricing, product prices can be modified throughout the day to minimise fresh food waste and increase profitability. The digital tags will also feature smartphone compatibility, which allows users to link with product information through their phones and register consumer preferences. "For the ASM system, the time saving is a big benefit. It requires a behaviour change for our staff, allowing them to be more proactive in restocking shelves instead of firefighting other matters. Once we get amber alerts from the system we can restock the shelves so that we don't get situations where customers are having their orders fulfilled from the stock room, as this is a poor use of time." "All of our technologies are aimed at giving our staff more time on the shop floor providing a better customer experience. If we have full availability, then customers will return, if we are able to give great service, customers will return - the two go hand in hand." Commenting on the new store, Conor Hayes, Sales Director, Londis said, "We in Londis are continually exploring opportunities to enhance the shopping experience for our customers and through this highly experimental process we believe we have developed a new store design that will allow our retailers to strongly differentiate themselves in the marketplace and meet the continually evolving needs and expectations of grocery retailing's multifaceted customer base." In addition to the new campus store, Londis, its parent company BWG Foods, and the DCU Innovation, have partnered to research and test new emerging technologies that could be integrated into the shopping experience of the future. Through this partnership, new concepts will be tested and pioneered through BWG's expansive supply chain and expansive store network. Donald Christian, Retail Manager, DCU adds, "Ultimately, as much as I say I want to improve retail in Ireland by showcasing the best standard, and the best technologies, there is no point in doing that unless we are increasing turnover. It has to hit the bottom line. I am confident that what we are installing here will certainly do that."